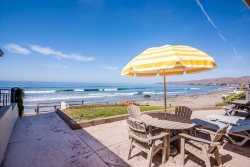 Beach House Vacation Rentals Cayucos , Sunny Hill Lookout, Cayucos Beach house, Central Coast vacation rental, beach vacation, Morro Bay stay, small beach town vacation, wine country, Paso Robles wine vacation rentals, family beach vacation. Welcome to Sunny Hill Lookout, with a view of the hills to the north and white water ocean views to the west and south! This bright, light filled home is conveniently located in the heart of downtown Cayucos and is adjacent to Hardie Park and Cayucos Pool. It's a 3 block stroll to the beach, pier, shops and restaurants. An open floor plan invites a spacious feel. Get cozy in the intimate living room with the gas fireplace in the winter, and open the sliders in the summer to feel the soft Cayucos beach air. The modern, well appointed kitchen includes lovely granite counter tops, a breakfast bar that seats 4 and the dining table that seats 6. Open the kitchen slider, and the deck welcomes you with a table and seating for up 10. This home has 2 bedrooms, 2 baths and sleeps up to 6 guests. The master bedroom has a queen bed, flatscreen TV, and an en-suite bath. The second bedroom has 2 twin beds, and the living room sofa folds out into a queen bed. One of its many wonderful features is the spacious wrap around deck with seating nooks. There are plenty of places to sit and read, or just enjoy the incredible views. Cieling fans in the living room and bedrooms will keep you cool. NO BBQ. Note: Cayucos Pool is seasonal (Memorial Day-Labor Day).